30th Street Blog: Beer Week: Shaking Hands and Kissing Babies aka Meet the Brewer! Beer Week: Shaking Hands and Kissing Babies aka Meet the Brewer! As you already know, San Diego's first ever Beer Week continues through this weekend. 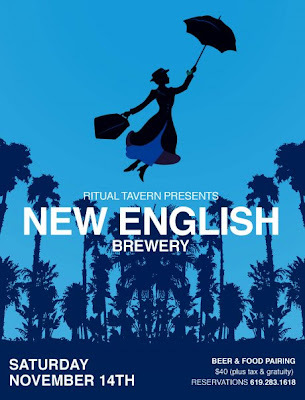 Here at the Ritual we are extremely excited to pair food with some of best beers in the world. Tonight we'll continue the trend by pouring Alpine Brew Co. 'Pure Hoppiness' on Cask and 'Duet' on tap. We'll also be serving BBQ Niman Ranch Pulled Pork Sliders (2) with sweet potato fries $8.50 in honor of the soon to be opened Alpine Brew Co. BBQ restaurant. Come in tonight and you'll have the pleasure of drinking with the brewer/owners of Alpine Brew, Pat and Val.